Many web sites make this claim. The ability to profit, or at the potential to be profitable, in 60 seconds. One minute. The shortest available expiry for most binary options traders. The riskiest and most unpredictable time frame to trade, in my opinion. The movement of the markets on a minute to minute basis are like the ripples on the edge of a wave as it merges with another and the tide is on the move. There are just too many factors in play at that level to predict the markets accurately so I always like to check out new sites proclaiming the benefits of 60 second trading. Usually what I find is a shady broker trying lure newbies into trading using the charms of quick profits to procure a new revenue stream. Sometimes, as is the case here, I find an SSP, a signal service provider. What I found is a very clever sales page. When if first began to investigate the web site I became confused. I was not sure of the purpose. I couldn’t tell if he was boasting, trying to sell something or an affiliate marketer. There did not seem to be any rhyme or reason except that he, I assume a he because there is never any name or address given, is really into 60 second trading. I clicked on About Me to find out more. He says the site is his personal platform for posting his opinion on 60 second binary options. One of his main goals is to help reveal the scum and the scams so you can choose from among the best resources. In essence, he wants to help you decide if this type of trading is right for you. After that I began to flip through his blog, checking out the post titles and looking at the different categories. I was a little shocked to find him in support of the Keith Jones Strategy, one that I don’t recommend. I also discovered that most of his posts are in all the same categories and did not provide much depth. When I clicked on a few posts I found them to be more of the same. A post marked as published on November 11th talked about how great of a trading day it was on July 7th, going on about how many trades were made and how many were profitable. He goes on and on about how you can use a $200 account and make 35-80% returns each and every day for days on end trading 60 second positions. He just doesn’t go into any detail about HOW to do it. Needless to say this is when I began to realized something was up. I still hadn’t gotten to the part about how this is a sales page and that is why this page is so clever. The website is like a tantalizing onion. There are layers upon layers of teasers that draw you in. You never find what you need, or what you think might be there, at least I didn’t. I must also point out that at this point in the reviewing I had not read a post all the way to the end. When I did that changed everything. The nugget at the bottom of the tunnel turns out to be a wicked sales pitch for a signal service software package. The text smoothly glides from recapping trading into how you can get a free trial for 30 days with no credit card. The clincher comes a little later when he points out that his technique is so profitable that you can pay the full $997 fee with your profits in just a week. Seriously? This is what is known as a Black Box. It is a packaged software that gives signals based on an algorithm created by its inventors. It uses a proprietary “Probability Gauge” to measure forex currency pairs. Each pair is listed and trades are only taken on those trades with a probability of 85% or more. This means any time you log in and check the gauge and it says 85% or higher on a pair you can make a trade with a 60 second expiry with a reasonable expectation of success. The problem is this is a program. It doesn’t have the ability to understand market conditions, or to be aware of impending news announcements and the like. The market is constantly changing and this program can not change with it. At least with a signal service you get some live support. There is more to trading than pure technical analysis, it takes a certain amount of insight and intuition you just can’t get from a machine. 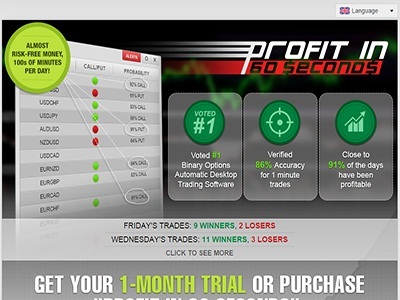 The final word on Profitsin60seconds.com and any black box, don’t use them, learn to trade for yourself. As for 60 second trading, it’s nothing more than a gamble.